It’s increasingly common for offices to let pets and their humans hang out together at work. That calm you feel with you snuggle up with a pet can only be helpful in achieving your workplace goals. Gunning Commercial real estate agency in Sydney, and Cunsolo Architects in Victoria have jumped on the fast growing international trend and are letting their employees take their pets to work. Both workplaces claim that the presence of the pooches both has a calming effect on their staff, as well as boosting staff morale. 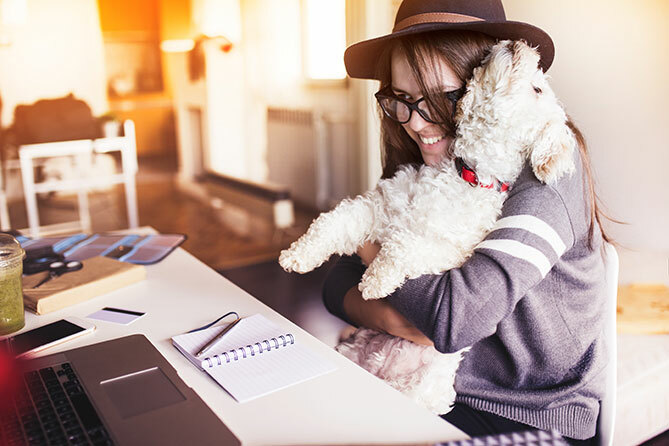 While this movement seems to be taking off in the pet-loving sectors of the business world, hopefully it’s only a matter of time before lots of different workplaces adopt the strategy. The evidence is piling up that pets help to create a much more relaxing and productive work environment. Pet owners with dogs and cats (and more!) know that bedtime can be a struggle – for bed space. That awkward battle between your partner and your pet for room on the bed is not fun for anyone involved. But when the world doesn’t offer what you want, remember you can always modify. Reddit user Robdogbird did just that with this 3.35 metre bed. He and his partner own five cats and two dogs between them, and all of them wanted to sleep on the bed. With such a gaggle of animals, you can imagine the competition for bed dominance was fierce. Rather than hurt any feelings, Robdogbird took things into his own hands. This huge bed was created by simply pushing two king beds together. Given the fact that their new bed was now taking up a lot of the bedroom, they also skipped the bedframe and boxspring so they could add storage underneath. Everybody wins! Virgin Australia recently announced free flights for rescue dogs. They’ve partnered with animal welfare groups to help connect surrendered or abandoned dogs with new owners interstate. Which is only good news for the animals. Across the sea, when the Fort McMurray wildfires wreaked destruction in parts of Canada, two Canadian airlines made it easier for people with pets fleeing the fires. West Jet and Canadian North bended the rules to make travel accessible for everyone by allowing displaced pets to fly in the cabin with their owners. Images of happy humans with their pets were a welcome chaser to the photos of the devastation in the aftermath of the fires. The Tenants Union of NSW has recently asked for a ban on clauses prohibiting pets in lease agreements. This came as part of their submission to Fair Trading NSW tenancy review discussion paper. Anyone searching for a home in Sydney with a pet will know it can be an unforgiving place, but if this review goes ahead, Sydney may change face to be a more inclusive city. While over in the States, Florida faces sweltering heat in the summer. Perhaps due to unprecedented rise in the climate, the state was dealing with a growing number of unfortunate incidents occurred where pets were being left in locked cars. So, Florida recently introduced House Bill 131, which allows Floridians to break into locked vehicles to rescue animals and people who are facing harm without reprise. Hopefully both of these laws can be used as examples in other parts of the world as well. Comedian Ricky Gervais and singer Miley Cyrus use their celebrity status in a big way in order raise awareness and help to change the way animal rights are approached. Both encourage people to adopt pets instead of going to a breeder, and regularly share information and petitions about the treatment of animals. In fact, Ricky won the Animal Hero Award in 2016 for his continuing work with animal rights groups. “Even though it doesn’t seem like much, signing a petition or even just sharing or retweeting something about a good cause makes a difference. It not only raises awareness and makes people think, but enough signatures can get an issue heard in parliament, and that can implement changes in the law. So thank you,” reads a post by Gervais. Inspiring, isn’t it? Change doesn’t happen without a bit of push, so get out there and see how you can help make the world a better place for you and your pet!